To provide for the safety and health of our Ebenezer community and visitors through professional emergency response from the adverse affects of fire, medical emergencies and hazardous conditions, while promoting an aggressive program for fire prevention and public education; we interact with all persons encountered like we would want our family members treated. The Vigilant Fire Company was organized in 1893, and later incorporated in 1896. During these earliest days of the company, a four wheel pump cart was used to help fight fires. It took four men to operate the hand pumps, which had to be hand-pulled to a fire scene by firemen or horses. It was convenient that Henry Frey’s bakery was at 615 Main Street, just down the street from Vigilant, his horse, which was used for deliveries, was often pressed into service when the alarm sounded. The hand pump remained in operation until it was replaced in 1920 by a motorized fire engine. The first audible alarm at the company was a large metal wheel rim off a railroad car from the Gardenville Yard of the New York Central Railroad. When a fire was spotted, the first member to the hallwould take a solid metal pole and smack the hollow metal wheel rim. The sound was unique and loud, and it carried for long distances. Vigilant was one of the first fire companies in the area to install an alarm system. Each alarm box was numbered, when an alarm was turned in, a bell in the steeple of the United Church of Christ would toll out the number of the alarm box. For example, if box 24 was pulled, the bell would toll twice, pause, and toll four additional times. Each fireman had a white card showing the box numbers and location. If the fire apparatus had already left the hall by the time they arrived they could respond directly to the scene of the fire. As much as Vigilant Fire Company was formed as a protection against fires, the company evolvedinto a center for social gatherings in the early years. The social environment of being a member still exists today, but in a much different manner. One has to imagine those early days in order to get a proper perspective of the times – no television, no cars, no radios, no computers, no refrigerators, no microwaves…and water had to be hand pumped. Well, you should be getting a pretty good idea that the community needed to entertain themselves. Vigilant served that purpose. Music played an important role in the days before radio and television. At the time of the Armistice (November11, 1918) which marked the end of World War I, the members of Vigilant formed a band and drum corps. They purchased their instruments from Denton, Cottier, & Daniels Co., on Court Street in downtown Buffalo. Al Richt, Bob Pletcher, and Val Eich were the leaders of the drum corps and providedmusic lessons to the other members. The principle instruments included the drums, bugles, and fifes. The band played at the hall during the welcoming back party for the soldiers who in the war. Sports was a major attraction for firemen of old, just as it is today. Back then, instead of watching games on TV,they played it themselves. The fire company sponsored a basketball team from 1921-1922 and the hall was converted into a sports arena. They played teams from neighboring fire companies and the city of Buffalo. The best players from Vigilant included Jim “Doc”Ehinger, Ed Mund, Earl Frey, Hal Webber, and Henry Moeller. Following each big game there was music and dancing. Vigilant Fire Company was renowned for having one of the best dance floors in Western NY. During the early years a popular way of socializing and raising money was by holding card parties at the hall. PENDRO was the game most liked. The card and dance parties continued through the 1950s. After the card party there was dancing to live orchestras. During the 1930s, the Charleston, which was a popular dance and considered risque by some was banned at the hall. Not because it was risque, but because the hall floor would buckle when everyone danced to this tune. Archaeological studies reflect that long before man even thought about keeping records on firefighting the same principle from hundreds of thousands of years ago applies today as it did back then. Simply stated, to extinguish a fire, “put the wet stuff on the hot stuff.” Back then, fires were used for warmth, cooking, protection of property, clearing of land, and even destruction of enemies; these uses still hold true today. The most universal method for starting fires in the beginning of time was by use of heat through friction. An instrument called a “fire drill” was the fire starter. It was a wooden rod or stick that was placed in the hollow of a fire board or rock, next to tinder. The stick was rapidly rotated between the palms of the hands to create the friction which started the tinder afire. There were other methods later developed for starting fires; but whatever the method of ignition, the early ancestors had to carefully tend to fires to ensure they were not extinguished. The invention of the wooden match with a chemical tip was one of the great inventions of the 1800’s. In 1827, John Walker, an Englishman, placed phosphorous sulfate in the tip of the small wooden stick, which would ignite through friction. As man became proficient at starting and maintaining fire, he also found the necessity for respecting and controlling it. History has demonstrated time after time the disastrous and tragic experiences when man has failed to provide the proper safeguards for this heat source. Obviously this is true with the disastrous fires throughout time, but again, it holds true today in our everyday lives in the Hamlet of Ebenezer, NY. The first organized firefighting force that can be traced in history was established in Rome by Augustus Caesar around 23 B.C. Augustus established a force of about 600 men who belonged to the familia publica, otherwise known as “servants of the commonwealth”. This force was stationed near the gates of the city. As slaves, they had few rights in the Roman society. They were often accused of slow response to fires and were reluctant to endure physical risk to save the lives and property of their Roman masters. Eventually they were supplemented by companies of volunteers, but even these volunteers never really enjoyed the favor of the government. After a serious fire in Rome, around 6 A.D., Augustus formed a squad of professional firefighters known as the “vigiles”or “watchmen.” These “vigiles” were divided into seven battalions of 1,000 men each, and were under the command by the “prafecectus vigilium”, a prefect of the equestrian rank who was directly responsible to the emperor. Well it’s not hard to see where the name origin of Vigilant is derived from. Their system of reporting is analogous to the fire chief reporting to the Board of Fire Commissioners. The Fire District organized in 1935 as a municipal fire district, for the purpose of providing fire and emergency protection to the Ebenezer community. Authority for the organization and operation of West Seneca Fire District # 6 is codified by Town Law of New York State. As the fire department located in the center of town, we respond to Fire/EMS/Hazardous conditions within our jurisdiction and provide mutual aid to five adjoining fire departments in the town. The Fire District is organized to: save lives, suppress and control fires, provide advanced and basic emergency medical services, fire prevention education, hazardous materials response, public assistance during natural/manmade emergencies and other activities deemed to be in the best interest of the residents of the community. It is the commitment of the Fire District, that while performing the organized tasks and prime functions of Fire Protection, Fire Suppression, Emergency Medical Response and other related emergency activities, we will provide to the best of our ability, a safe working environment, endeavor to prevent accidents, illness, fatalities, and comply with all applicable laws and regulations as set forth by the State of New York. First and foremost, the department’s responders are what make the organization; not rules, policies, procedures, best practices, fire apparatus, etc. In the public’s eye, the department is not measured by the big red trucks and volumes of written documents (although most important and necessary) they do not produce the service our responders deliver. The success of the department is based entirely on the members who serve. It is understood that every member is an important part of the organization which goes to defining our culture and spirit. 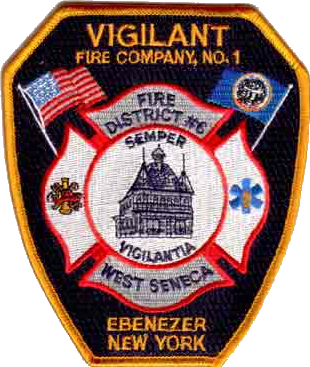 The Fire District organized in 1935 as a municipal fire district for the purpose of providing fire protection to the Ebenezer community and mutual aid assistance to other areas in need. The authority for the organization and operation of the West Seneca Fire District # 6 is codified by Town Law of New York State and under the direct control of five Board of Fire Commissioners. There shall be one chief and two assistant chiefs. As the fire department is located in the center of town, we respond to Fire/EMS/Hazardous Conditions within our jurisdiction and provide automatic mutual aid to five adjacent fire departments and to other locations beyond the town when requested by county and/or state officials during times of crisis or disaster. The Fire District is organized and functions to: save lives, suppress and control fires, provide basic/support for emergency medical services, fire prevention education, hazardous materials response, public assistance during natural or manmade emergencies and other activities as deemed to be in the best interest of the residents of the fire district. Weekly training is provided to include hands-on, classroom; district and county and state approved courses are an integral part of the training along with national conferences and hands-on training programs. The training program is under direct control of a training officer with oversight from the chief’s and board of commissioners. Safety Officers are an integral part of all hands-on training to ensure all personnel are safe during all drill and training segments and evolutions. It is the commitment of the Fire District, that while performing the organized tasks and prime functions of providing Fire Protection, Fire Suppression, Emergency Medical Response and other related firematic activities, it will provide to the best of its ability, a safe working environment, endeavor to prevent accidents, illness, fatalities, and comply with all applicable laws and regulations as set forth by the State of New York. All members and responders must put loyalty to the highest moral principles to country and fire department above loyalty to any persons, groups, position or title holders. All must uphold these rules & regulations, district policies, operational guidance, best practices and directives. All shall seek to find and promote more efficient and economical ways of getting tasks accomplished consistent with safety of responders while using taxpayer dollars. Expose corruption wherever discovered. Uphold these principles, ever conscious that public office and position is a public trust and test.